Thanks for looking at our Grriggles Rope Bones Red Dog Toy, 8-inch! Grriggles Rope Bones Red Dog Toy, 8-inch; Grriggles Rope Bones are a great way to satisfy a dog’s natural urge to chew. These dog toys are made from natural cotton rope. 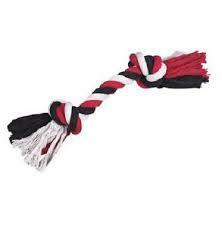 Key Benefits Natural cotton rope toys satisfy a dog’s urge to chew Help to naturally clean teeth Long lasting, durable dog toy.